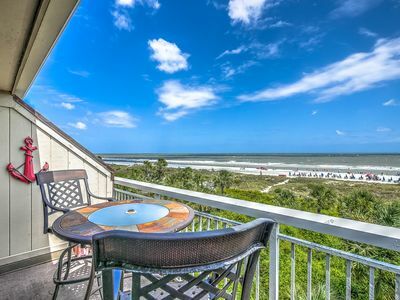 Prime Forest Beach Location- Only 180 Steps to the Beach! 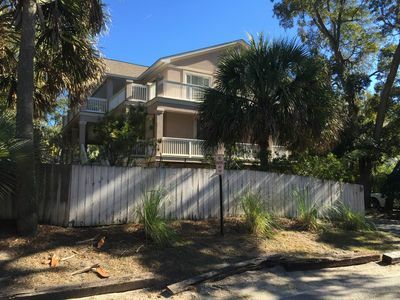 Fabulous North Forest Beach location less than 180 steps to the beach! This is by far the best value in North Forrest beach. No need to cross a busy street to get to the beach! 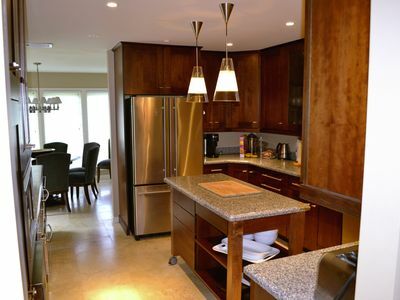 Grab you friends and family and soak up the sunshine in this fully furnished, six-bedroom home. This house was new in 2002 and has been updated since. Amenities include flatscreen TVs, gaming system, high-speed secure internet access, and free long distance calls inside the US. 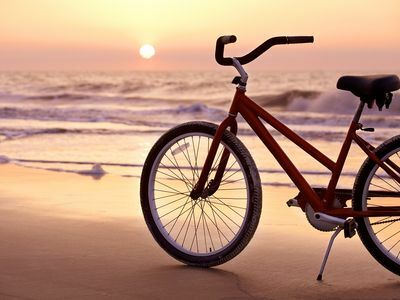 The house also comes with the use of four beach cruiser type bikes. 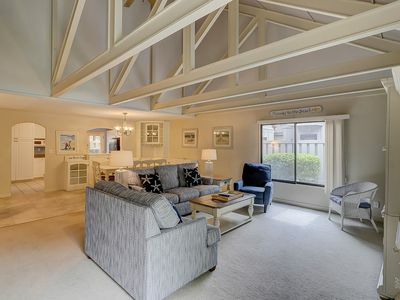 Our home is a wonderful place to kick back and relax. 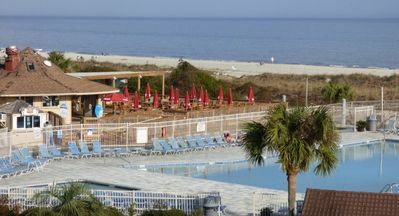 Enjoy the sunshine at the pool or take a very short stroll to the beach. 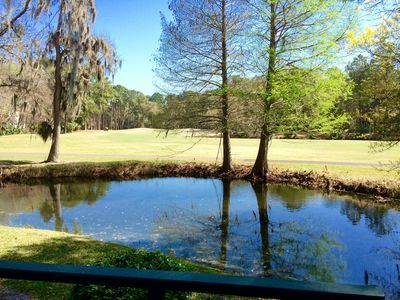 Enjoy a round of golf, play tennis, bike the beach, or relax in the pool. 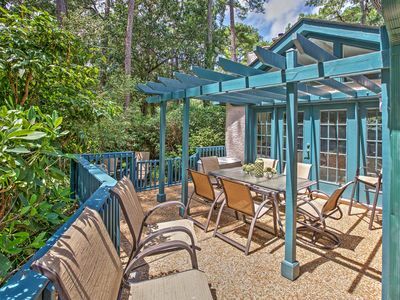 Shopping and restaurants at Coligny Plaza are just a short 5 minute walk away. 3 single beds, 1 bunk bed (twin up/full down configuration). ~Downstairs Master Bedroom- One king bed (2 persons). Downstairs Master bedroom has its own walk in closet, LCD TV with DVD player, and attached master bath (double sinks, shower and Jacuzzi tub). bedroom has direct access to the large first floor wrap around deck. ~Upstairs Master Bedroom- One king bed(2 persons). Upstairs Master bedroom has its own walk in closet, plasma TV with DVD player, and large master bath with two sinks, Jacuzzi tub, and shower. Bedroom also has direct access to the large second floor wrap around deck. ~Upstairs Bedroom Two- One queen bed(2 persons). 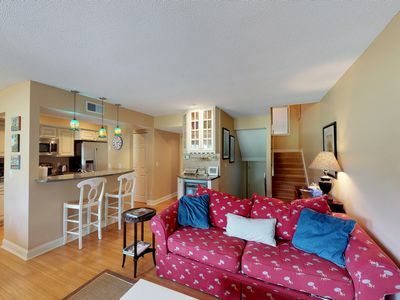 Shares a large bathroom (double sink, shower and jacuzzi tub) with adjoining bedroom #3. ~Upstairs Bedroom Three- One single bed, one Twin/Full bunk bed (3 persons). Shares an adjoining bathroom with bedroom #2. Bathroom has 2 sinks, a shower and a Jacuzzi tub. Room also has direct access to the large second floor wrap around deck. ~Upstairs Bedroom Four- One queen bed (2 persons). 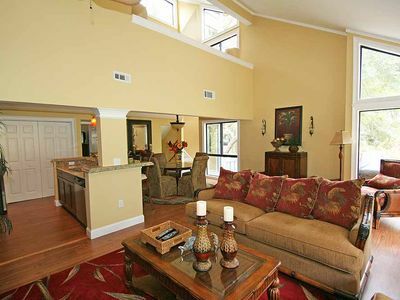 Bedroom has LCD TV with DVD player and direct access to the large second floor wrap around deck. shares a full bath (across the hall) with bedroom #5. ~Upstairs Bedroom Five- Two single beds (2 persons). 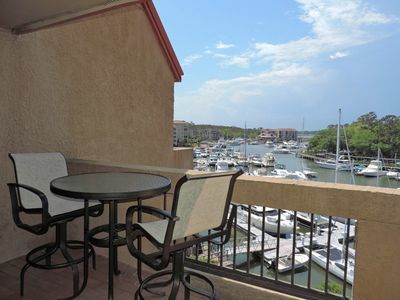 Has direct access to the large second floor wrap around deck and adjoining full bath. - ALL RENTERS MUST BE AT LEAST 25 YEARS OF AGE. - No House Parties are allowed. - No more than the stated maximum number of people may occupy the home. - No pets are allowed (except for service animals). - Renter(s) are responsible for any/all member(s) of their party and any persons they allow onto the premises. Any/all damages are the responsibility of the renter(s). 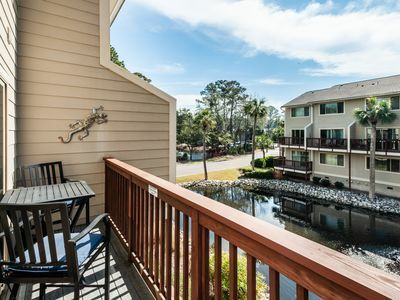 - All renters must sign a rental agreement, abide by the terms contained within, and all rental charges/deposits must be paid in full before the premises can be occupied. - Owner reserves the right to immediately remove any renter who violates the terms of the contract or who engages in any illegal activity without refund or compensation. Note: Rental *INCLUDES* all state and local taxes. The initial house cleaning is included. 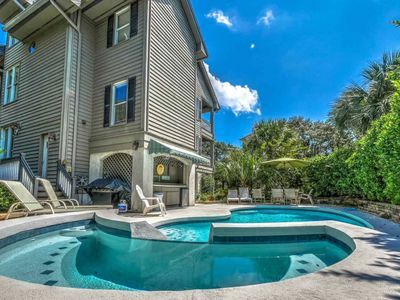 Outdoor Jacuzzi/pool heated upon request for an additional $400 per week charge. $1000 USD deposit is required to complete the booking (balance due 90 days in advance of your stay). A credit card is required for a security/damage deposit. If you cancel less than 90 days prior to the first night of your stay, payments (less 50%) are refunded - full refund if re-rented. 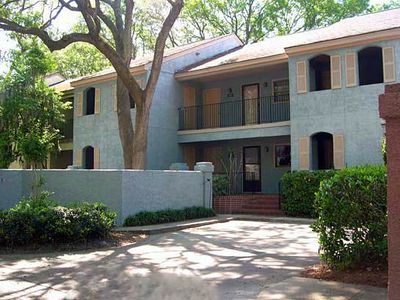 2 BR/2.5 BA - Sleeps 6 - Community pool - 5th fairway of Shipyard Golf Club - Bike to the beach. 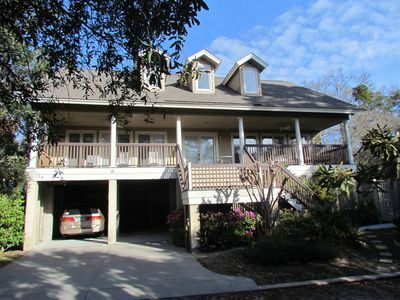 822 Ketch Ct -Gorgeous 3BR/3.5BA! Sleeps 6! Walk to Harbour Town! Pool access included! Million Dollar Sunset View of Harbour Town Golf Links! 10% off for Sept and Oct! 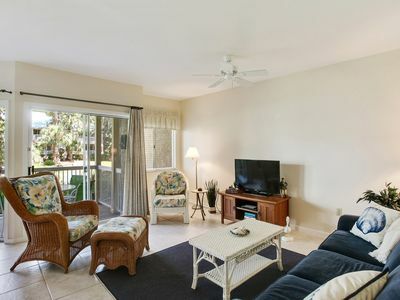 Spectacular Ocean View Beach & Tennis Villa, renovated, all new furnishings! 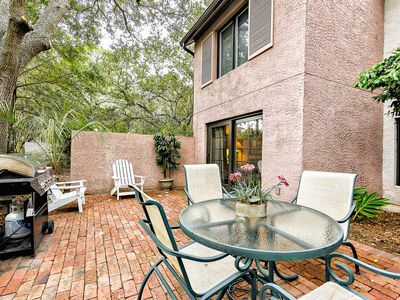 Spacious home moments from the beach with private pool, spa, and more!